CitizenM in Amsterdam Central is the second of its kind opening back in 2009, and we loved it! It was so different from where we would usually stay. With a large bank of computers at the door you do your own check in, and we paid the little bit extra to check in early having been up from 4am. We were given the option of floor we would like and what view we would like our window to open over, this was a great touch, and sets CitizenM away from the crowd when it comes to personalisation of check in. 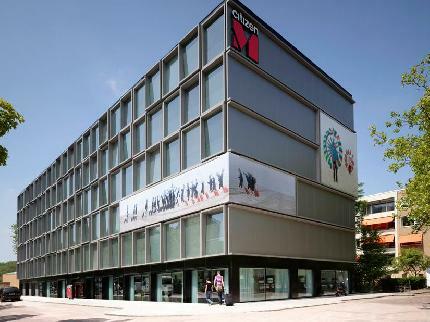 The moto for CitizenM is ‘afforadble luxury for the people’ and they certainly give you this. Our room was basic but very stylish, and brimming with fun! The blinds, lighting and temperature were all controlled by a remote that also doubled up as the remote for you TV too. The light was mood lighting featuring an array of colours above the shower and toilet. Within your room price you get unlimited wifi, movies and international phone calls. Yet another aspect that sets CitizenM away from its competition; not many hotels give you free calls, let alone international. I have a feeling my mother got sick of my phone calls after the third one! The movies may not be the most up to date but we certainly made the most of them. The location is a little further out than what we had hoped, but Amsterdam’s transport is super cheap and very reliable. You’re only a 5 minutes bus journey for the Olympic Stadium, which is a great place to visit with lots of hands on activities. The hotel also boasts 4 iMacs for your use with free printing, a 24 hour bar and food, and loads of places just to sit and chill out. Being a design hotel the seating is crazy and sometimes appears to be defying gravity! You feel totally at home here. If you’re ever looking for a cheap (ish) place to stay in Amsterdam that still offers you fun, all your basics and some of the friendliest staff around, then CitizenM is the place for you.